Woodland Willa resident Eileen Hunt is seen here seated with PSW Karen Brennan in the home’s Triobike, surrounded by her family. 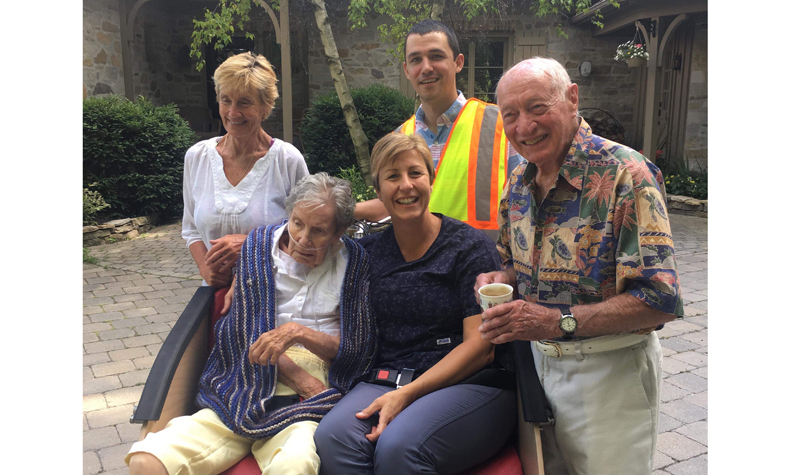 On July 7, Woodland Villa resident Eileen Hunt made a surprise visit to her husband Ed at the house they shared prior to her moving into the Cornwall-area long-term care home. The visit was made possible thanks to the Triobike Woodland recently purchased. The Triobike is a three-wheeled bike with a two-seat carriage at the front. Sitting in the carriage with personal support worker Karen Brennan and a life enrichment staff member at the helm, Eileen was taken to visit Ed and their family. It was a special visit for Eileen, says Woodland Villa administrator Janna Sabourin. Janna notes that Ed regularly visits Eileen at Woodland Villa, and when he can’t make it, one of the couple’s children or grandchildren will be there to visit. Given that Eileen is always receiving visits from her family members, it was nice for her to be able to visit them, Janna says. It was especially important to Ed, she adds. “He loves his wife very much, and the simple fact that we were able to surprise him with a visit from her was phenomenal,” the administrator says. Janna says Eileen was an avid gardener. Since there was no wheelchair on hand to take Eileen to the backyard garden for a visit, plans are in the works for a wheelchair to be available for her next visit so she can spend time in the garden, which Ed has been taking care of. “We are all in amazement about what this bike has brought to the home so far, and we’re looking forward to many more stories like this one,” Janna says.